Field tested to extend pressure capabilities. Dia•Tuff™ was specifically developed to meet our customer’s ever more demanding requirements and have been successfully field tested in a variety of heavy duty applications including: load cells, safety relief valves and actuators. 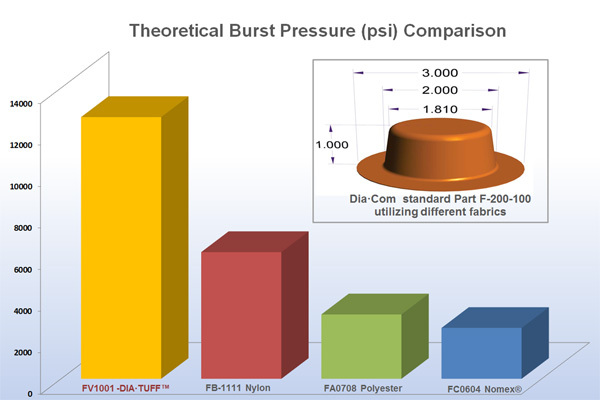 Dia•Tuff™ diaphragms have the ability to be dynamically stable under a wide range of adverse environmental conditions that include: temperatures up to 500F and pressures over 6000psi, high abrasion, moisture and caustic chemicals. DiaCom Corporation, an ISO 9001 and AS9100 certified company, is a recognized leader in the design, manufacture and application of innovative, high performance molded diaphragm seals. DiaCom serves a variety of markets worldwide including industrial, automotive, aerospace, food processing, water controls, medical instrumentation, appliances and others. DiaCom offers state-of-the-art diaphragms designed for cost effectiveness, ease of installation, durability and high performance characteristics.